Summer is here!!! 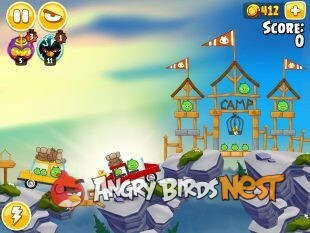 Angry Birds Seasons is rejoicing the glowing warmth of summer with a brand new episode called “Summer Camp”. Time to fling some birds while recalling those joyful memories of “Summer Camp”. The update is out now for iOS and Android via Google Play and the Amazon Appstore. 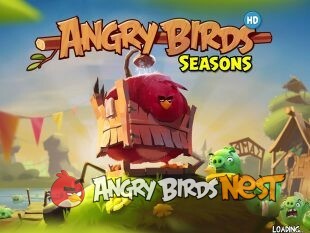 Note, if Angry Birds Seasons is crashing try following @angrychicken’s advice. Play new levels in the all new Summer Camp episode, and challenge your friends in the new Pig Challenge! 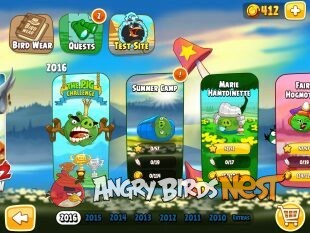 21 New Levels in the Summer Camp episode! Our walkthroughs are now live. The Pig Challenge. 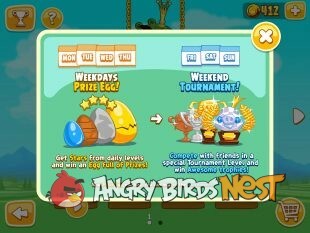 Collect stars in 4 levels during the week & play 1 new level on the weekend! 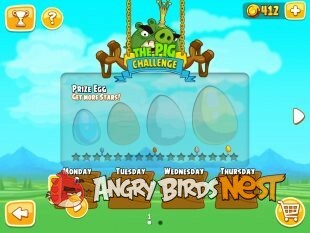 Prize Eggs – Increase your prizes in the Pig Challenge & claim your loot every Friday! No more Pig Days levels. This episode has ended. Camp Neversleep episode? (warning) I paid the $4.99 for this, but I’m not seeing a new episode. I will try to find out more details, but for now I don’t see it actually unlocking a new episode. The leaderboards is live, so go enter your scores!. Remember that scores obtained with Power Ups are not permitted on our leaderboards. 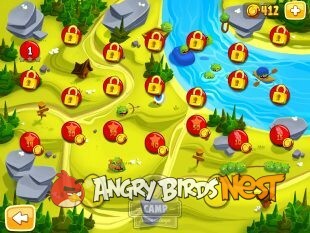 Nav: Home »News » Angry Birds News & Updates » Angry Birds Seasons Summer Camp Update Now Available! 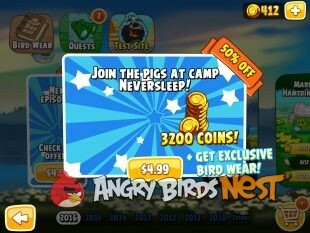 As far as I can see, the Camp Neversleep “episode” is just an IAP for 3200 coins and some birdwear. At least, that is what I get from the description, but I haven’t bought it. It’s a bit sneaky to call this an “episode”. Am I the only one who isn’t a fan of these levels being put out the last two years or so? Throw bird, bird hits stuff, stuff falls and hits more stuff, more stuff hits yet more stuff, etc… All in slow motion on most of the levels. It gets pretty monotonous. When it was just the Pig Days levels it was okay, but the entire last few new episodes have all been that way. They just are not fun like the older levels were. All the flinging type games have been that way since the beginning. When I’m offline, I can play the ‘normal’ levels, but I can’t play the daily challenges. Pity! Wow, somehow managed to lose all progress. Lost all the episode progress, pig challenge scores, and I think I lost the quest items too. It’s not a lot of time wasted, but this should never happen. Admittedly I was tinkering with the Facebook log in. That might have something to do with it. While I don’t like the idea of getting Facebook involved, sigh… fine, whatever. How does this exactly work though? What’s the best way to do this? Tried asking loads of stuff but deleted it all because it became way too long, messy and unorganized. There are quite a lot of things that can happen: playing while log off, log in as guest, log in as real account, logging out from guest, logging out from real account, airplane mode, crashing, new phone, restoring from backup etc. Having FB login in the series, finally brings us a way to back up our progress, which was either formally on the cloud, which I don’t like.. as my previously purchased levels, I now have to pay for again to play them.. or the long way to back up and restore your data as provided in detail on this site as well. However.. with FB logged in, I can now play the game on either of my phones, and continue where I left off, on one or the other. Seeing as one phone my daughter uses, and I the other.. we trade off on progress on several games that have this function. When you are logged out on said phone.. it will not save your progress to FB, but stays on the phone. If you get a new phone in the future, simply log in to FB and let it upload your current progress. Set up new phone and log in to restore. Same. Literally can’t pass level 1 – it crashes each time it’s about to show me the score screen. I can’t pass level one. While awaiting my score, it crashes and dumps me out. iPad version. On my scoreboard : scoreboard 22 out 21 anybody now how? ? Game crashes then won’t restart unless you switch to airplane mode, even then game randomly shuts off or freezes. So glitchy I’m prob not going to play anymore till there’s a fix. Why release a product that doesn’t work!! I feel your frustration, Jamie! To report your problem, go to the Rovio Support Page and submit a request. Hopefully they’ll have a solution soon for many of us experiencing the same issues. Game crashes after I complete level 3, then has difficulty re-loading. Using iPhone..
Am I the only one who still hasn’t been able to play because of crashing? They’ve totally removed Pig Days in this update. Boo! Hiss! Can’t even go back and play the ones I hadn’t 3 starred (again). Oh, wait, I found it. Like someone said on the first page on comments, it’s located as the ‘first’ episode of 2016. Really dislike the new conglomerate walk through. On my IPad, with the automatic advance, in order to play a video a second time I must leave walk through and start again. It’s awkward and a time waster. 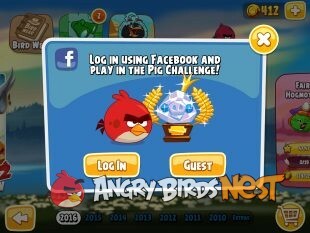 Anyone have comments regarding the new pig days, or am I the only one that doesn’t care for it. 4th star is a cruel joke.60K over the threshold in Pignic 1-19,still failed to obtain it.Suspecting more IAP. Agree. I could only get the 4th star by demolishing the level with a shockwave and a telebird and keep all the lineup birds for the 10k bonus – using even one bird and it’s only 3 stars. I did this on one level to see what’s the difference between the egg levels but it’s only more PUs… since I don’t use them this 4th star and the higher eggs are useless for me.